Count Charles (Karl / Károly) Leiningen-Westerburg was born in 1819. into an ancient German noble family. As many other family members he was bred and trained for a life of professional soldier. Charles was married to Erzsébet Sissányi de Törökbecse, a daughter of a Hungarian landlord, becoming himself a proprietor of the Hungarian estate near Törökbecse. In 1848. he joined the Hungarian army sent to the south of the country to deal with the uprising of the Serbian population, and when the war turned into a Hungarian revolution against Austria and Austrian imperial army (with which he previously served), he decided to stay in Hungarian army. He quickly rose up through the ranks, being promoted first to a rank of major, then lieutenant colonel, colonel and finaly a general. He was executed in 1849 along with other Hungarian leaders when the uprising was broken down. “The Letters and Journal (1848-49) of Count Charles Leiningen-Westerburg” were prepared and translated to English by Henry Marczali and first published in 1910. 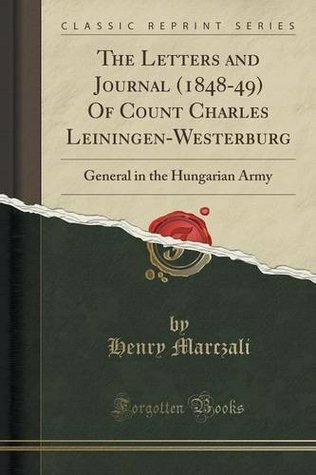 Within this publication he included a long and detailed introduction, laying the background for and retelling the events of 1848-49 Hungarian revolution, and also narrated the origin and life story of Charles Leiningen-Westerburg. The letters are mostly those written to Leiningens wife, and the journal was written during his imprisonment days before his execution, and on their own would not be enough to follow the events, so Marczali’s introduction helps to put everything in context and fill in the gaps. However, Kossuth’s current prevailed and national homogenization was pursued aggressively by imposing Hungary as official language in all public spheres of life and curtailing all local autonomies. Serbian uprising started after Kossuth refused requests by the delegation of Serbs from southern Hungary to recognize their previous privileges (such as an autonomy in church life and preservation of language). Rascians is an exonym used mostly by Germans and Hungarians when referring to Serbs in southern Hungary (Raška is the name of a territory in present day central Serbia from which one of the most successful Serbian medieval states originated). By 19th century, Serbs of Hungary started regarding this name insulting and a Serb delegation asked Kossuth in 1848. that their national name be used instead, which he consented. However, Marczali consistently uses the name “Rascians” throughout his introduction, written and published well into the 20th century. The letters sketch a picture of a stiff and unlikable young carrier soldier of aristocratic origin. Born and raised in Germany, he served with the Austrian imperial army and married a daughter of a wealthy Hungarian landlord. When the political crises started in 1848, he needed to side either with Hungarian government or the Habsburg court. He claims that he was sympathethic to the Hungarian cause, but being a German landlord in southern Hungary who did not speak a word of Hungarian and additionally an officer of Austrian Imperial army, I think that his motives had more to do in proving loyalty and securing his estate. Other then occasional “hugs and kisses”, most of those letters sent to his young wife hold very little warm or personal. They are mostly political expositions or battle briefings. After his capture he was no longer able to send letters, being well aware that he will probably be executed very soon, he spent his last days writing down accounts of his battles in his journal, concerned more about his legacy and painting a picture of himself as brave and capable soldier rather then saying last farewells to his young family and accounting for leaving them and wasting his life for a cause that was not really his. He received a decent education, no doubt, but I think he could not be called enlightened, either in his views on politics or assessments of people of other class and ethnicity then his (especially non-Hungarians). His often fostered double standards, for example, being a passionate German nationalist, he advocated that all foreigners should leave Germany and never rule it again, and expressed his delight about Germans winning against Danes. However, in the very same letter (dated May 1st, page 86), when commenting the Serbian uprising he says: “In Torontal and Bacska the Illyrian mischief has begun”. Also when talking about the unruly and undisciplined Serbian irregulars (mostly consisting of peasants) he dismisses them as cowardly, but later he admires equally unruly, undisciplined and cowardly Hungarian irregulars. He was a witness to the civil war and many atrocities committed by both sides. He did not take part in them, in fact he sometimes disapproved of them, and sometimes he accepted those committed by Hungarian troops, though with regret, as necessary and understandable retributions. My impression is that he never did enough to prevent them, even when he was in position to do so, especially at the later stages of war when he became a senior officer. Butchering of Serbian civilian population that was supportive of their troops in the war zone can be excused, but later, when the war moved north into central Hungary and the battles were fought between Hungarian and Austrian armies, he admired the local Hungarian civilians who supported their troops. Every day, several carts full of Rascians (mostly women and children) approach our outposts; and the miserable wretches beg and pray to be taken prisoners, as to stay in the Rascian camp means starvation. Pale, reduced to mere skeletons, they ask the soldiers for a bit of bread, which they devour like so many ravenous wolves. The military commanders offer these poor fugitives refuge; but the civil authorities would exterminate them if they could. Innumerable Rascians have been hanged; three were executed to-day. It is no business of mine to inquire whether this is the best mode of subjugating them; for my part, the very sight of such measures is revolting.